I hosted the board meeting for our historians’ organization on January 23. Did you know that January 23 was National Pie Day? One of our board members knew that, and she suggested we each bring a pie, sweet or savory, to fuel the meeting. And so we did, with contributions ranging from onion and provolone pie to pear pie in a graham crust. A delicious meeting. We did some work, too. There’s a long history of proclaiming a day, week, or month to mark—and hence advertise—particular foods and food products, in the same way that we mark off some time to raise awareness of a certain disease or honor a notable volunteer or throw a festival about roses or the borax industry or steam traction engines. The national ones may be announced by presidential proclamation, others by a governor or mayor or council. Many are self-proclaimed by a trade group. 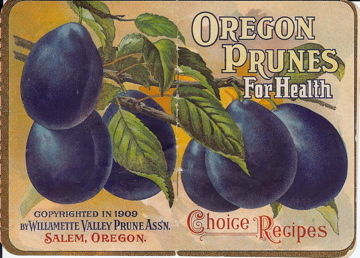 January is Prune Breakfast Month! You may well be aware that prunes have long held a reputation for keeping one’s tract moving along, and that prunes for breakfast were considered most helpful in giving the day a proper start. 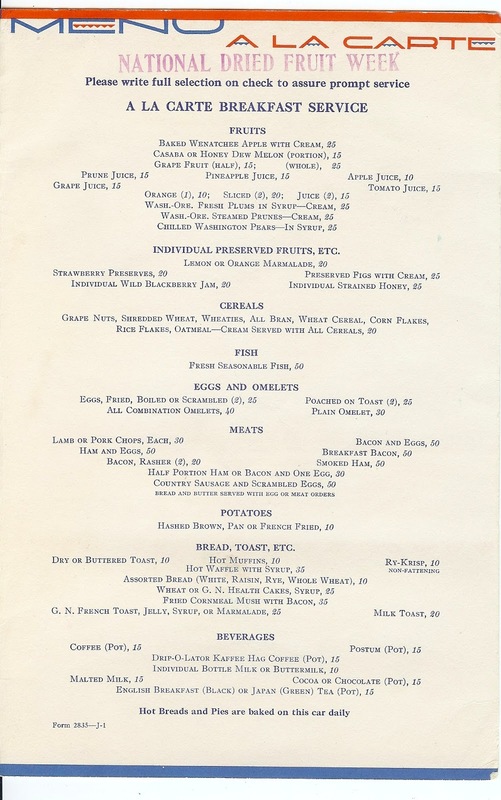 This breakfast menu from the 1930s, from a dining car of the Great Northern Railroad, features not only Pacific Northwest steamed prunes, but also the similarly laxative offerings of prune juice, fresh plums, and preserved figs! National Dried Fruit Week has passed from the calendar, and so has Salmon Day. 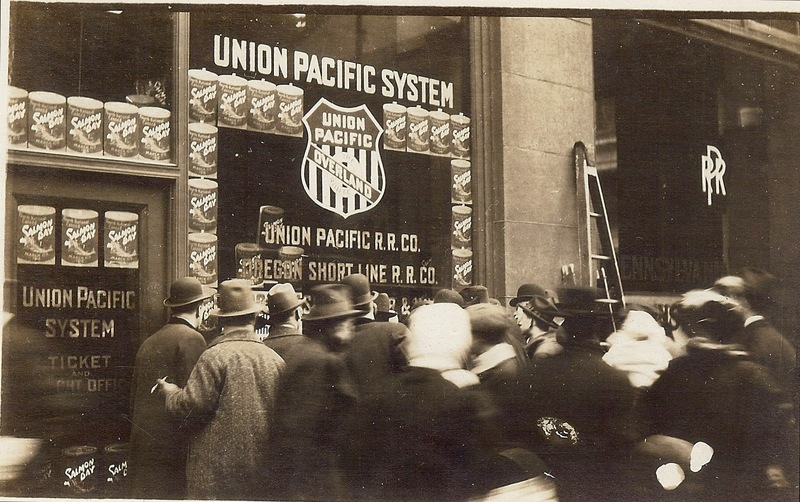 This photo postcard was mailed to the Columbia River Packers Association (CRPA) in Astoria by J. Eleonfield, Pittsburgh general agent for the Union Pacific System, “The Salmon Route.” The typed message: “Crowd looking at Window Display, Union Pacific Railroad Office, Pittsburgh, Pa., account National Canned Salmon Day, March 10, 1916.” One of the CRPA brands was Bumble Bee; by the 1950s, Bumble Bee was better known for its tuna than its salmon. Few of us eat prunes for breakfast today, despite Prune Breakfast Month. 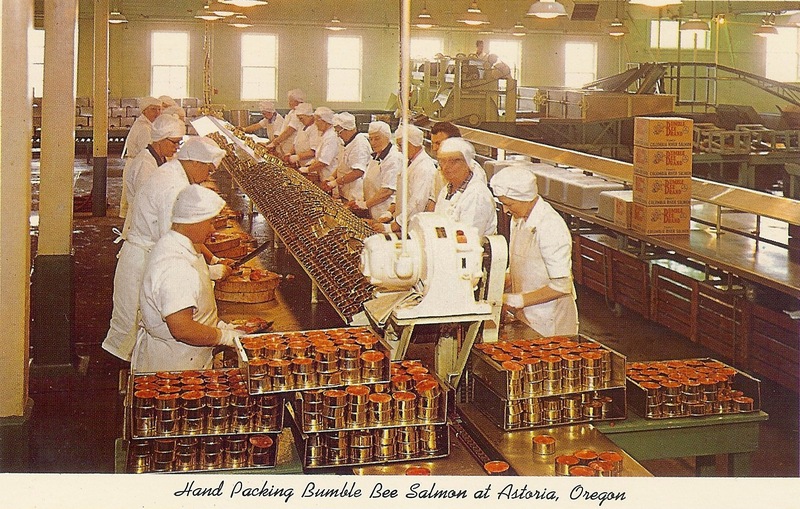 There is no national day of celebration for canned salmon or tuna, which successively for nearly a century led the list of cheap protein foods in America. But we do still call out pie. And pie for breakfast was just as acceptable a century ago as it is today.